Coronary computed tomography (CT) angiography is a noninvasive method for visualizing coronary artery disease. 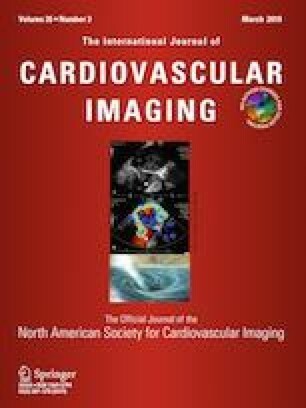 However, coronary CT angiography is limited in assessment of stenosis severity by the partial volume effect and calcification. Therefore, an accurate method for assessment of stenosis severity is needed. A 10 cm diameter cylindrical Lucite phantom with holes in the range of 0.4–4.5 mm diameter was fitted in a chest phantom. The holes were filled with an iodine solution of 8 mg/mL. To simulate coronary artery disease, different levels of stenosis were created by inserting Lucite rods into the holes with diameter range of 2–4.5 mm. The resulting lumen cross sectional areas ranged from 1.4 to 12.3 mm2. To simulate arterial calcification, calcium hydroxyapatite rods were inserted into the holes with diameter range of 2–4.5 mm. Images of the phantoms were acquired at 100 kVp using a 320-slice CT scanner. A maual and a semi-automated technique based on integrated Hounsfield units was used to calculate vessel cross-sectional area. There was an excellent correlation between the measured and the known cross-sectional area for both normal and stenotic vessels using the manual and the semi-automated techniques. However, the overall measurement error for the manual method was more than twice as compared with the integrated HU technique. Determination of vessel lumen area using the semi-automated integrated Hounsfield unit technique yields more than a factor of two improvement in precision and accuracy as compared to the existing manual technique for vessels with and without stenosis. This technique can also be used to accurately measure arterial cross-sectional area in the presence of coronary calcification. The authors would like to thank Ms. Rachel Smith for her help with data analysis. This work was supported in part by a Grant from Canon America Medical System Inc.
S. Molloi has received grant funding from Canon America Medical System Inc.